Where Does Clawson Get its Water From? Clawson is part of a consortium known as the Southeastern Oakland County Water Authority, also known as SOCWA. Clawson is one of 11 communities in Southeastern Oakland County which make up SOCWA. One of the advantages of the SOCWA consortium is purchasing water from the Detroit Water & Sewer Department (DWSD) during off-peak hours (usually from 2 AM until 5 AM) at a reduced off-peak rate. This allows SOCWA to sell water to its 11 member communities at a lower rate than if each community had to purchase water directly from DWSD and store that water in water tanks we would have to build individually. We would also be responsible for testing and maintaining those tanks at our own expense. SOCWA purchases and stores water in multiple storage tanks owned and maintained by the consortium directly from DWSD. A few years ago, the Counties of Wayne, Oakland, and Macomb formed an authority to help manage oversight of the DWSD and named the authority the Great Lakes Water Authority (GLWA). This authority established a board of directors to help ensure fair treatment to all customers of the DWSD. The GLWA has worked to control cost increases and establish a plan for infrastructure upgrades that would be shared by the members who utilize the vast DWSD supply of water in Southeastern Michigan. How are Water Rates Established in Clawson? The water rate in Clawson is established in part as a pass-through cost from the purchase of water through SOCWA. There is also a fixed rate charge for the expenses of running and maintaining the water system that is paid regardless of the amount of water purchased. There is also a component of the charge for the expense of billing and operating the water system to our Clawson residents and businesses. The combination of the SOCWA Rate Charge, the Water Operating Charge, and the Water Infrastructure Depreciation Expense is what makes up the consumption rate in Clawson. The consumption rate is charged to users of the Clawson water system based on the amount of water which flows through the water meter. Our Water Department utilize touchpad readers to gather the water reading through the touch pad on the side of every residence and business in Clawson. That reading is then stored and downloaded at the Department of Public Works building on W Elmwood and then bills are generated from those reads each month. The City of Clawson is broken into three mostly residential districts and a small commercial district for billing. Each residential district is billed quarterly for the usage of water measured in 100’s of cubic feet. The small commercial district is billed monthly. It may be easier to relate to the volume of water in gallons rather than cubic feet. The fixed charge of the water rate is $18.00 per quarter for residential customers, or 39.65% of the total amount billed per 100 cu/ft. This covers the water system fixed operating and billing costs and fixed pass-through costs from SOCWA. The consumption rate is $2.740 per 100 cu/ft. $1.566 of this cost is pass-through cost from SOCWA, which is 34.49% of the total rate of water billed. The remaining charge of $1.174 per 100/cu/ft is for our consumption based operating and maintenance costs of the water system. The total rate for Water is $4.540 per 100 cu/ft billed quarterly and is an increase of 3.06% from the 2017-2018 water rate of $4.405 per 100 cu/ft. Where Does Clawson Send its Sewage for storage and Treatment? Clawson is a part of the George W Kuhn Drain Drainage District (GWK) which is under the authority of the Oakland County Water Resources Commissioner. The GWK transmits, treats, and sends sewage to treatment facilities before it is released back into the lakes, drains, and rivers in and around Oakland County. There are currently 12 different communities in the GWK. Our system is part of the areas Combined Sewer Overflow (CSO) system which carries both sanitary and storm sewage to the storage and treatment underground facilities of the GWK District which is located North of 12 Mile Road and East of Interstate 75. The sewer rates are on average 67% of the total billing for water & sewer. Sewage rates are generally more than twice the rate of water consumption since it costs significantly more to remove, contain, and treat sewage than it does to store, treat, and deliver water to homes and businesses. Wayne, Oakland, and Macomb Counties also pooled resources to join the Great Lakes Water Authority for oversight of sewage transmission, storage, and treatment. The GLWA worked with DWSD and completed studies to establish rate increases that are manageable and would treat the suburban customers of the Detroit Water and Sewer Department fairly in the future by having oversight authority and a representative on the board from each County. Since the establishment of the GLWA the rate increases have been managed below 4% each year and should continue to be less than 4% for the next five years and longer. How are Sewer Rates Established in Clawson? Many people wonder why we charge for sewage based upon the amount of water that each resident and business uses. Since not all of the water we use goes into the sewer system, it seems logical to wonder why we charge for sewage based on water consumption. The reason for that is because that is how the entire GWK system is set up to bill us for sewage. The City pays for sewage transmission, storage and treatment based on the amount of water we purchase from SOCWA. This may seem unfair on the surface, but the system adjusts this charge when they set their annual rate charges for sewage based on measured sewage flow from Clawson and we pay an apportioned percentage of the overall system. Although we pay and bill for sewage based on the rate we use and sell water for, the amount we are billed is actually based on the calculated amount of sewage that we send into the combined system each year. The GLWA increased the rates for sewage by 1.5% from last year. Much like the water rates, we have a fixed billing cost amount that covers our fixed operation costs outside of the consumption pass-through and operations charge. The sewer fixed billing charge is $20.10 per quarter for residential customers. This is 21.82% of the total sewer charge. The consumption rate has pass through costs for Sanitary Sewage Disposal of $2.027 per 100 cu/ft and Storm Sewer Treatment of $3.957 per 100 cu/ft. These pass-through costs amount to 64.97% of the total sewer charges. The operating and maintenance portion of the consumption charge is $1.216 per 100 cu/ft. This is only 13.2% of the total sewer charge. The total sewer charge is $9.210 per 100 cu/ft. This is an increase of 4.07% over the current year’s rate. The reason for the increase is for operating and maintenance cost increases as we continue to clean and televise our sewer system for future repair plans. The final component of our water and sewer rate is a $9.00 per quarter charge for residents that pay the State Revolving Fund debt payments from our sewer repair and replacement program completed in 2012. The City repaired, re-lined, or replaced the sewers that were rated the worst in our study from 2008 and 2009 when we used grant money to clean and televise our entire sewer system. That project utilized over $3.9 million in loans to fix the sewers that needed immediate attention and repair. 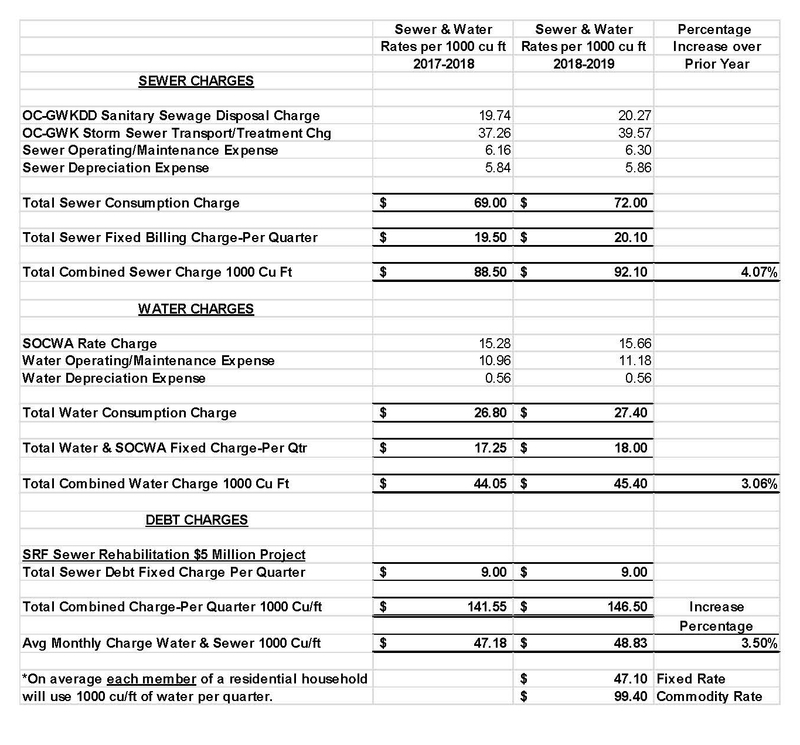 The last page shows the water and sewer rate breakdown from the current 2017-2018 fiscal year budget which runs from July 1, 2017 until June 30, 2018, next to the 2018-2019 fiscal year rates and shows the percentage increase in each category and the overall percentage increase of 3.50%. The rates are shown as rates per 1,000 cu/ft.